Back in 1996 Warner Brothers brought us the hit film "Twister" now in 2014 the same studio brings us "Into the Storm". As in "Twister" "Into the Storm" hasn't much of a story, what little story there is, is only to introduce characters so that they can be put in harms way when the inevitable storm arrives. As is the norm now a days the havoc that ensues is part filmed by the characters themselves, either using hand held cameras or mobile phones. The action, and there is a lot of it, takes place in some fictional Midwestern American town called Silverton. It's here where the school vice principal Gary (The Hobbits,Richard Armitage) has tasked his two sons, Donnie (Max Deacon) and Trey (Nathan Kress), to film a time-capsule video involving other students and people from around the neighbourhood. The hope is that it will be viewed by them again in 25 years. Unlike them we know that it's only really it'd an excuse to introduce us to paper thin characters that are about to get literally blown away. Little do this small town know that the most powerful storm ever to hit the USA is closing in on them and if things couldn't get any worse, it's graduation day and everyone is packed into the school. Hot on the heels of this mega storm is a meteorological team, led by seasoned storm chaser Pete (Matt Walsh), and his assistant Allison (The Walking Dead's Sarah Wayne Callies). The team are travelling in a tank of a vehicle that they've named Titus. The team hope to be the first to drive into the eye of a storm and film it. When the storm does finally hit the special effects are terrific, cars and trucks are thrown through the air whilst buildings get obliterated in an instant. There's even a homage to "Twister" in a blink and you'll miss it shot of a plastic black and white cow flying through the air. 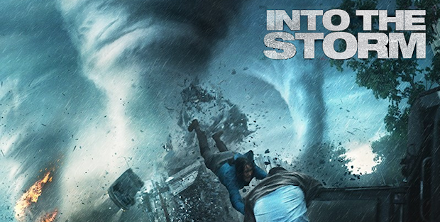 I'm sure that if you're going to see "Into the Storm" you're going to see it for the action and the special effects and not the character development. If that's what your looking for then you won't be disappointed.